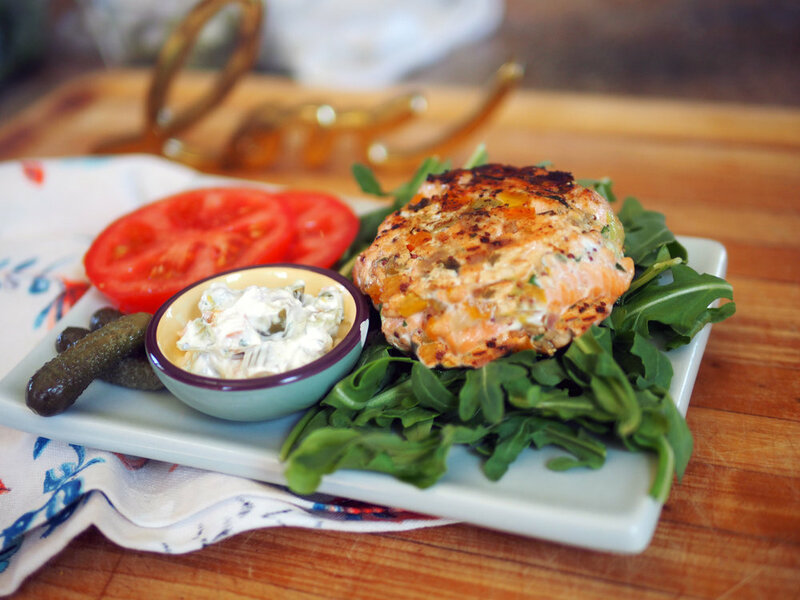 Salmon Burgers - San Gluten & Eggs... WHAT? Some of you know that I have an allergic reaction to wheat, yeast and eggs (plus a few other foods). So I try to eliminate those as much as possible. Which means even foods containing just a smidge of bread or eggs to hold them together are quite literally my unraveling. And thus, blacklisted from my repertoire. Seriously, how much deprivation can one woman withstand? I love me a fish burger, but alas most use bread or bread crumbs, and almost all use eggs. What's a gal to do? Being stubborn and wanting what I want is when the thinking cap needs to be fully stretched and used to its fullest. Unscramble the mystery and find another way to hold the darn thing together. 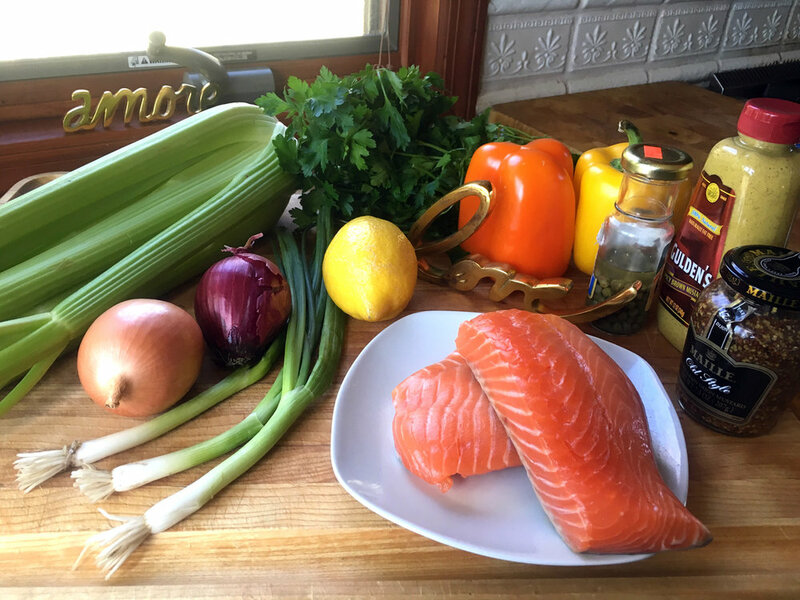 The setup of what was to become a really tasty salmon burger. Mise en place all the vegetables as directed. Then in a cast iron pan or skillet, sauté onions, celery, peppers, 1/4 c scallions in oil, season with salt and pepper. 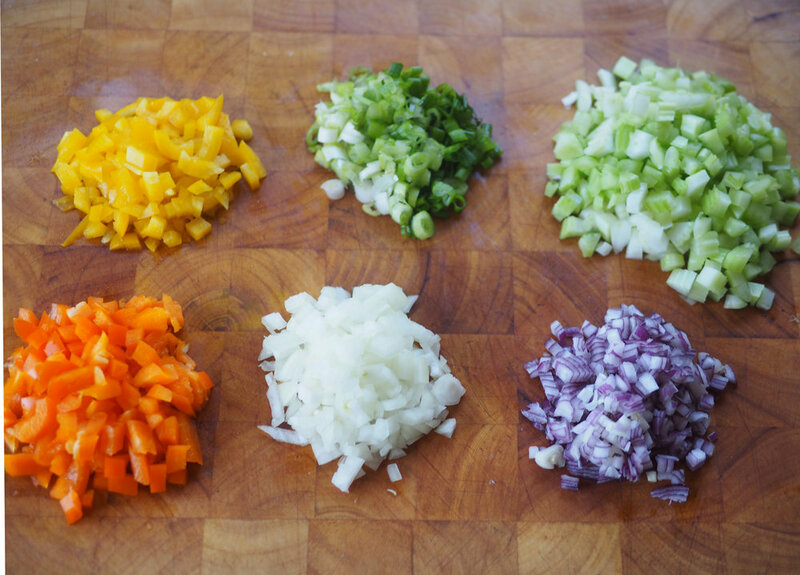 Mise en place is French for "everything in place", meaning prep all your ingredients so they are ready to go. They sure look pretty like this but go ahead and mix them together for even sautéing. Let them cook slowly over low heat until softened. When done, set aside and let cool. Meanwhile, cut the salmon into 3 equal parts. One part cut into 3/4" cubes. One part cut into 1/4" cubes. One part pulse in a mini food processor to create a paste. Salmon paste that will be the glue to hold the other two together. Next chop the parsley and rest of scallions. In a bowl, add all three portions of salmon. Then begin adding all filling ingredients: 1/2 c of the cooled sauté mixture, capers, the mustards, 2 T scallions and parsley. Mix together until well combined, then form patties, and refrigerate for 15 minutes to 1/2 hour. Salmon prepped in 3 sizes: Big cubes, smaller cubes and a paste. Start building the burger flavors by adding the vegetable sauté. Then the mustard, and so on. Then form your patties. This makes 6 medium burgers. While the burgers are chilling out, move onto the relish. All it takes is a bowl to combine all the ingredients together, stirring until well incorporated. Then refrigerate until ready to serve. The lineup for the relish. 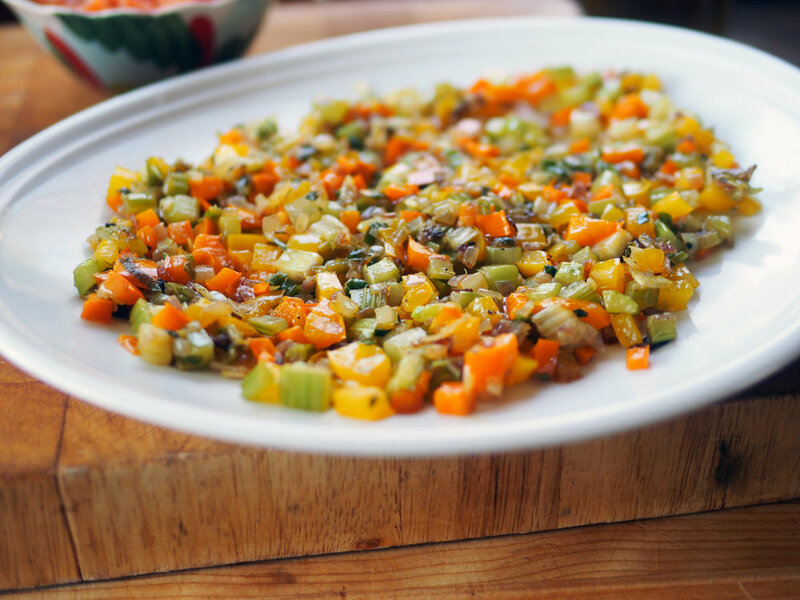 Homemade relish is so fresh and delicious. It can be used on baked potatoes, or over rice even. After the patties have had their chilled rest and are firm, they are ready for frying. You have choices at this point. You can either fry as is without any coating, or dust them with either potato flour* or corn grits**. Using my 6 burgers I experimented making 2 of each kind to see which we liked best. Jill and JC liked them plain with no coating. I also liked the purity of the plain one, but I liked the corn grits coating due to the outer crunch. And if you search your memory banks, or this blog you will remember that I love crunch. Test which one you like best. *If you use the potato flour coating, cook these at a lower heat since the the finer powder texture cooks faster and will burn if heat is too high. ** Corn grits are a larger grain, which gives it the crunch. But if you don't want as much crunch factor, then you can use a stone ground corn meal which has a finer texture. Corn grits. See those grains of ground corn? That's what gives it Crunch! Potato flour is much finer, almost like talcum powder. About to make crunchy goodness. I like using a cast iron skillet because the pan retains the heat and gives a nice outer crust. Fry on both sides until you see the salmon turn pink, about 2-3 minutes each side, depending on thickness. Front left has potato flour coating. Back center has the corn grits, while front right is sans any coating. The final lineup from left to right: Potato coated, no coating, corn grits coated. You can see how much darker the potato coating got. Serve immediately with slices of tomato, arugula or boston lettuce, and some cornichons. Any lettuce works fine, but I really enjoyed how the spicy flavor of arugula plays off the salmon, Don't forget the homemade relish. It's tangy, sweet and delicious. JC and Jill both told me that they don't usually like relish, but plopped spoonfuls of my homemade version on their burgers. The next night we had fish. They broke out the relish again! Hey, since this is such a healthy version of a burger, no bread filling or bun, go ahead and splurge by serving up some fries or a baked potato. You can even use the relish on that, too. With Memorial Day steaming down the tracks, these could be a great addition to your outdoor party. Just because I need to eliminate some foods doesn't mean I can't enjoy things I love. And just because these are sans bread and egg definitely doesn't mean they are sans flavor! Oh, how I love mushrooms. Oh, how I love polenta. So, is it any wonder that, oh, how I love this appetizer. I have made these tasty bites for many an occasion. Be it a formal dinner party, a buffet for a crowd or a simple first bite to a meal. They look impressive on a platter, but they are even more pleasing to the palate. You've heard me rave about polenta before. It can dished out in an abundance of ways. Creamy and soft, molded and fried. For breakfast instead of grits or crumbled up on a salad instead of croutons. As an app or a main meal. Some foods are just like that, they give and give like the famous tree in children's book, The Giving Tree. "Here boy, take my stone ground corn and make magic with them." I love that book, and I love polenta. Did I say that already? Well, I do. Keeping with the abundant uses mode, you can top polenta with other veggies or even proteins like shrimp or pulled pork. But today's recipe features earthy mushrooms. That's what I had available, so that's what I made. I only had Creminis on hand but I have made this with a combo of mushrooms. I implore you to explore and mix and match to suit your taste buds. Cook the polenta according to the package. Whisking as you slowly pour it in to avoid any lumps. Once it is cooked and reached a thick consistency, add salt, pepper to taste and stir in the butter until melted. Then pour the polenta out onto a buttered baking sheet. Using a spatula, spread the polenta evenly out. I usually use a larger sheet pan so the entire polenta base is thinner. But I was at my mom's house and her pan was smaller, so these were thicker. In the end, I liked the size of these. You can choose the thickness according to whatever floats your boat. Since I was taking the photos, I enlisted my mom to help out with the action shots. It's fun cooking with her. Spread it out to create an even layer. Once the polenta is evenly spread, cover it with plastic wrap and allow it to set in the refrigerator. Meanwhile, start cooking the mushrooms by adding 2 tablespoons of oil to the pan. I like using a cast iron pan as it retains high heat and gets a good sear on the mushrooms. The key to mushroom cooking is let them cook on one side without moving them around. This allows them to get nicely browned. Also, salt them when they have browned. If you add salt too early to the cooking process it makes the mushrooms release water. I also cook mushrooms in batches in order to avoid crowding the pan. Too many reduces the pan heat and they begin to steam instead of sear. Once all the batches are done, remove the mushrooms and cook the garlic, rosemary and parsley in more oil. Then add to the mushrooms. I grated some lemon zest over the mushrooms which brightens the flavor. (you can also zest more once you assemble the whole dish.) Set aside while you continue preparing the polenta. Once the polenta is firm, cut into squares or use a cutter. I was going to cut these into my usual small squares using a knife, but I found a round ravioli cutter in one of my mom's drawers and thought it would be fun to use especially because it had a scalloped edge. This time I got my sister, Alyssa, to help with the action shots. Of course, using a square cutter or a knife will eliminate waste, but I liked the rounds. And don't worry, I didn't waste all the leftover cut outs. I fried them up and added them to my salad. Using the same cast iron pan, add oil to coat the pan and fry the polenta rounds in batches until crispy and golden brown. These are already cooked, so you just want to get them crispy. Remember, varying textures make food more interesting. Crunchy outside with soft inside. Once done, place them on a baking sheet, so you can keep them in a warm oven until all have been fried. Then top them with dollops of goat cheese, and with a spoonful of mushrooms. You can see that some of the rosemary from the cooking the mushrooms snuck onto the polenta. That is less of a problem and more of a blessing. Make the platter look pretty by using the rosemary sprigs as adornment. We had some roasted red peppers also as an appetizer. It made a wonderful partner to this earthy, crispy bite. Side note: Using a 2" ravioli cutter, I got about 18-20 pieces. You can get more if you cut the pieces smaller and in squares. Also, this is an appetizer than can be prepped ahead of time. You can make, and even fry the polenta ahead of time. Then when you are ready to serve, pop them in the oven to warm them up and assembly. Enjoy polenta, the giving tree of corn!